Three days ago, on October 2, Microsoft started pushing a new Windows 10 update, the Windows 10 October 2018 Update, to users. As with previous Windows 10 updates, the new update breaks compatibility with 7+ Taskbar Tweaker. With previous updates of Windows 10, I published alpha versions of 7+ Taskbar Tweaker while working on compatibility for the new update. But this time there will be no alpha versions – the gradual updates will be through beta versions, and until the final version is ready, contributors can try the experimental support with an access code. See the 7+ Taskbar Tweaker and Windows 10 insider builds post for more details. Currently, the 5.5.0.4 beta version is available, which was designed around Windows 10 insider build 17713 but partially works with the Windows 10 October 2018 Update. I’m aware that it’s not fully compatible, and I’ll do my best to fill the gaps as soon as I can. You can get the support code for the beta version here. Update (October 12): v5.5.0.5 beta is available. This version fixes most known issue. Update (November 9): 7+ Taskbar Tweaker v5.6 was released, which includes the final Windows 10 October 2018 Update support for all users. Posted in Software, Updates at October 5th, 2018. 93 Comments. With the release of Windows 10 in September 2014, Microsoft announced the Windows Insider program, which allows participants to test pre-release Window 10 builds. Unfortunately, due to the tight coupling of 7+ Taskbar Tweaker with the internals of Windows Explorer, every new Windows 10 build may break compatibility, and it often does. While working on compatibility with the initial release of Windows 10, I tried to keep it working with every build as it releases, which was a lot of work. I realized that I’m chasing a moving target, doing the same adjustments again and again. So since then (and until today), I decided support only non-insider Windows 10 builds. Even though polishing the tweaker to work on a new Windows build is a lot of work, having it to not crash while maintaining some/most of the functionality is usually much easier. So I decided to resume limited support for Windows 10 insider builds. I’ll try to fix critical incompatibilities when I find out that a new build breaks 7+ Taskbar Tweaker completely, provided that I’m able to allocate time for it. Just like previously with alpha versions, support for insider builds will be only available to those who supported the project with a donation. Another change that I had in mind for some time, and finally had the chance to implement, is getting rid of alpha versions of the tweaker. 7+ Taskbar Tweaker has official release versions and beta versions, and alpha versions felt redundant and confusing given the size of the project. One of the reasons I kept using alpha versions is to be able to provide early access to a limited amount of users as soon as possible, before it’s ready for the masses. Starting from 7+ Taskbar Tweaker v5.5.0.3 (beta), experimental support for new Windows builds will be released with public beta versions, but will be locked by an access code. The access code will be available to those who decide to support the project, just like it was previously with alpha versions. 7+ Taskbar Tweaker v5.5.0.3 provides experimental support for Windows 10 version 1809, based on insider build 17713. You can get it here. Posted in Software, Updates at August 6th, 2018. 6 Comments. A new update for Windows 10, the April 2018 Update (was referred to as the Spring Creators Update, also known as Windows 10 version 1803, code name Redstone 4), is being worked on by Microsoft for a while, and should be released on early 2018. According to online sources, build 17133 should have been the final build to be released to the wide public, but it appears now that the release was delayed (sources: one, two). As with every Windows update (see previous blog posts), 7+ Taskbar Tweaker needs to be updated to support the new Windows version. I have been asked by many users to provide an updated version of 7+ Taskbar Tweaker, and since 17133 was believed to be the final version, I began working on it. For now, I did enough adjustments for the tweaker to load without crashing, but didn’t test all of the tweaks. I plan to do that in the near future. As with previous updates, those who contributed to the project can download the early alpha version here (removed) and try it out. Update (May 20): A non-beta 7+ Taskbar Tweaker version with Windows 10 April 2018 Update support is now available. You can get it here. Posted in Software, Updates at April 16th, 2018. 151 Comments. A new update of Windows 10, the Fall Creators Update, is going to be available at October 17. As with every major Windows update, 7+ Taskbar Tweaker isn’t compatible with the new version (see my previous posts for details). I managed to get my hands on the new Windows version, and dedicated some time to work on an update for 7+ Taskbar Tweaker to make it compatible. Fortunately, there weren’t as many surprises as in the previous updates. If you’re running the Windows 10 Fall Creators Update, please try the latest beta version of 7+ Taskbar Tweaker, and let me know if you encounter any issues. Update (October 19): A non-beta 7+ Taskbar Tweaker version with Windows 10 Fall Creators Update support is now available. You can get it here. Posted in Software, Updates at October 8th, 2017. 69 Comments. 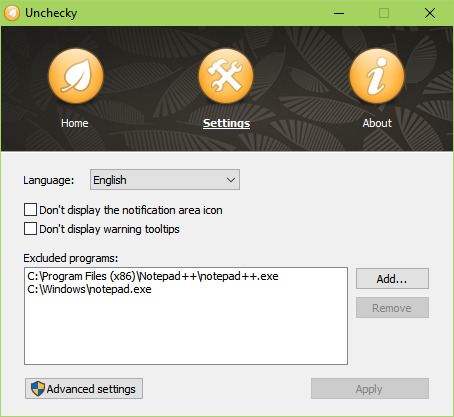 As described in the UserEcho topic, several antiviruses can show a warning when Unchecky tries to interact with their interface. Adding the antivirus to the excluded list of Unchecky should solve this issue. In rare cases, an incompatibility of Unchecky with another program can cause issues. In these rare cases, the conflicting program can be excluded as a workaround, until we officially solve it in Unchecky. Two years ago, Unchecky v0.4 introduced support for browser offers. Upon the introduction of the new functionality, only Firefox, Chrome, and Internet Explorer were supported. With Unchecky v1.1, we are adding Microsoft Edge to the list of supported browsers. Posted in Software, Updates at October 3rd, 2017. 11 Comments. Textify is a tool which allows to select and copy text from many places in Windows where it’s not possible otherwise. This includes error messages, dialogs, lists, and even elements of the taskbar. Since its release in March, Textify hasn’t seen much new functionality, but there’s one feature which I had in mind for a while: integrating web services with Textify. Textify could then be used for quick actions such as translating text, searching the web, looking up a word in a dictionary, and many more, which can be quite handy. Posted in Software, Updates at October 1st, 2017. 4 Comments. As you might know from my previous post about Windows 10 Creators Update and 7+ Taskbar Tweaker, I was working on an updated version of the tweaker for the new Windows 10 update lately. Last week, I have released an alpha version which fixed all of the known issues with the new Windows 10 update. No other issues were reported, and today I’m happy to announce that 7+ Taskbar Tweaker for Windows 10 Creators Update is publicly available for beta testing! The beta version can be downloaded here. Please report any issues that you encounter. Thank you, and many thanks for all the supporters who helped me reach the donations goal for the porting effort. Posted in Software, Updates at May 4th, 2017. 50 Comments. Posted in Software, Updates at April 16th, 2017. 71 Comments. Microsoft’s Windows 10 Creators Update is ready, and is rolling out to users since yesterday. Unfortunately, as many of you have noticed, 7+ Taskbar Tweaker doesn’t work with the new update. Upon launching the tweaker, the following error message shows up: “7+ Taskbar Tweaker: Could not load library (104)”. This breakage is expected, unfortunately. Like with the release of Windows 8, Windows 8.1, Windows 8.1 Update 1, Windows 10, Windows 10 November Update and Windows 10 Anniversary Update, this update requires some changes for 7+ Taskbar Tweaker to work correctly. Include the word w10u3p (Windows 10 Update 3 Porting) in the donation comments to specify that your donation is targeted for the porting. Like with previous updates, all donors will get access to early alpha versions during the porting process. Update (April 16): The first alpha version is available! More details here. Update (May 20): Windows 10 Creators Update is fully supported by 7+ Taskbar Tweaker. Posted in Software, Updates at April 12th, 2017. 112 Comments. As some of you might have noticed, 7+ Taskbar Tweaker v5.2 was released about a week ago. The main feature of the new tweaker version is the support for the new Windows 10 update, known as the Anniversary Update, which was released on August 2. Apart from the support for the new update, v5.2 brought some new features. Below are some of them. Have you ever experienced the following taskbar ordering issue in Windows 10? I encounter it once in a while, and I wanted to have a fix for it for a long time now. Finally, the virtual_desktop_order_fix advanced option of 7+ Taskbar Tweaker v5.2 fixes this issue and preservers the order of the taskbar items when switching between virtual desktops. Posted in Software, Updates at September 15th, 2016. 75 Comments.